The Second Bank of the United States traces its origins to the expiration of the First Bank’s charter in 1811. Congress of the late 1700s and early 1800s was bitterly divided on the issue of a central banking system. Opponents ranged from agricultural and frontier interests who believed a central bank would cater to industrialist and urban interests, to proponents of a literal interpretation of the constitution who believed that to create a federal banking system would overstep the powers of the national government as outlined by the constitution. As is the case of today’s congress, the congress of the 1800s stubbornly clung to their ideologies at the expense of a unified policy, even as the financial situation approached crisis levels. In 1790, George Washington was initially reluctant to sign the original bill that created the First Bank of the U.S., as he and many in his cabinet believed the establishment of a national bank was unconstitutional. He was persuaded otherwise by Treasury Secretary Alexander Hamilton, though the bank remained controversial in many circles. When the bank’s charter expired, it was not renewed despite objections from Treasury Secretary Albert Gallatin. With the expiration of the Bank, the U.S. was financially unprepared for the War of 1812, and Gallatin had to resort to taxes and loans from state banks to finance it. During the summer of 1814, many state banks suspended specie payments—federal currency backed by precious metals—and began issuing their own credit notes. By the end of that year, the Federal Government could not pay interest on its national debt. Alexander Dallas, a resident of Philadelphia, was chosen as the new Treasury Secretary. President Madison’s choice of Dallas was seen by many as indicating renewed support for a national bank. Dallas managed to bring the government budget back into surplus and restore the specie system, as well as champion a national bank. The bank bill of 1814 was debated in Congress for almost two years, drawing opposition from Federalists and constructionist Republicans, but was ratified by President Madison—an opponent of the First Bank of the United States—on April 10, 1816. The primary shareholder was the U.S. Government and the second largest was Stephen Girard, the wealthy Philadelphia banker whose involvement would lead to the founding of Girard College. Two Philadelphia architects competed to design the bank: Benjamin Latrobe and his student William Strickland. Strickland’s ambitious design, modeled on the Parthenon of Athens, was chosen. Strickland designed many buildings in Philadelphia, including the Blockley Almshouse, the Merchants’ Exchange, and the First Unitarian, but he was always proudest of the Second Bank. He had the façade of the building included in the background of his 1829 portrait painted by John Neagle. The cornerstone was laid in 1819 under the presidency of Langdon Cheves and the building was completed in 1824 under Nicholas Biddle. The finished building is considered one of the finest examples of Greek revival architecture in the country. Eight columns in the simple Grecian Doric style adorn the exterior, and Ionic columns decorate the interior which is designed in the late Georgian style popular at the time. The Bank was authorized to establish branch offices, managing 24 by 1831. 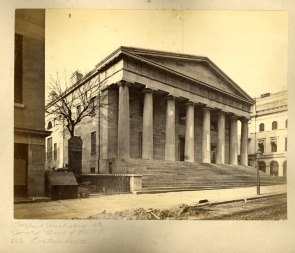 These branches were often designed as copies of the mother bank in Philadelphia, and resulted in a spread of Greek revival architecture throughout the country. The third president of the bank, Philadelphian Nicholas Biddle, was a forward-thinking investor who used his position to promote infrastructure and industry. His aristocratic leanings attracted ire from Andrew Jackson’s newly formed Democratic Party. Many of its members were mistrustful of northern industrialist interests and powerful central banks. Jackson himself developed a powerful mistrust of the Second Bank, and any bank not backed by specie, during the Panic of 1819 when he struggled to pay his personal debts. During Jackson’s first term as President he freely criticized the bank and its policies. Spurred by congressional Whigs led by Henry Clay, Biddle applied to recharter the bank in early 1832, four years before the charter was scheduled to expire. Clay and Biddle hoped to force Jackson to make an unpopular decision in an election year, thus ensuring a Whig victory. The plan backfired. Jackson vetoed the bill and soundly defeated Clay in the election. Upon expiration of the charter in 1836 the bank became a private corporation and was liquidated in 1841. Many of its branches became state banks. The bank was added to the National Register of Historic Places in 1987. As of 2006, it is included in the Independence National Historical Park. The interior of the bank now serves as an art gallery, housing many of the portraits of Charles Wilson Peale, sculptures by William Rush, and other works by famous Americans. Bray, Hammond. The Second Bank of the United States. Excerpt from Historic Philadelphia: From the Founding Until the Early 19th Century. American Philosophical Society. 1953.